Heathrow has this week (22nd March) belatedly published the results from its Fly Quiet & Green programme for Q4 2018. In this scheme Heathrow assesses 7 different aspects of environmental performance, but it only publishes a single, numeric “Fly Quiet points” score for each airline. That published score is the sum of the Fly Quiet points awarded to the airline for each of the 7 metrics. But that part that is far from transparent, with the 7 numbers per airline not made public. The results put out by Heathrow do not make any sense, and do not appear to properly reflect the actual noise. Rather, they appear to be manipulated to make noise levels look lower than they really are. This time around instead of giving the airlines an average score of around 750 out of (optimum) 1000, as with previous quarters’ results (already grossly inflated), Heathrow has hiked the average score by over 8% to 813 points. The expected average (mean and median) score should be around 500. But not content with inflating the scores even more than usual, Heathrow has also inexplicably excluded 5 (China Southern, El Al, Korean Air etc) of its 50 busiest airlines from the results – but added others instead. 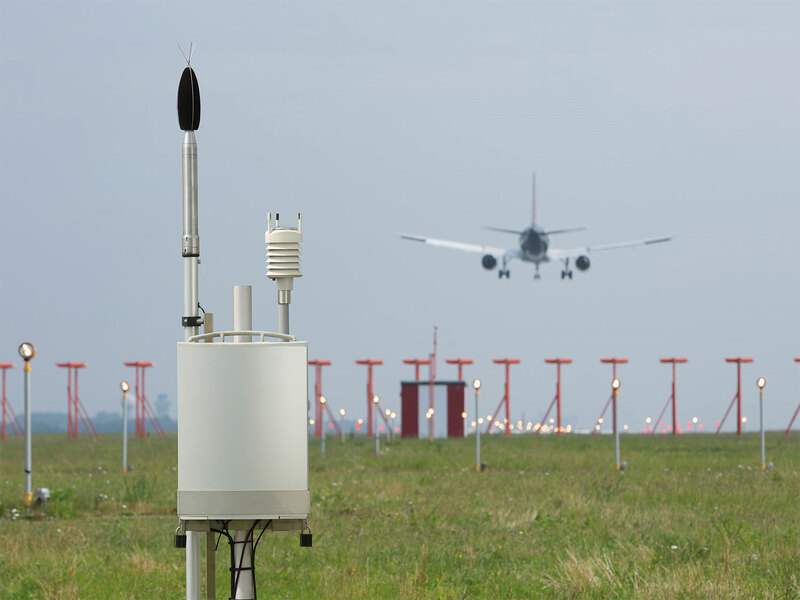 The Fly Quiet & Green programme aims to measure, assess and compare the environmental characteristics and performance of the airlines that serve Heathrow and the aircraft that they use (we fully support that aim, though not the way it has been implemented). Heathrow assesses seven different aspects of environmental performance, but it only publishes a single, numeric “Fly Quiet points” score for each airline. That published score is the sum of the Fly Quiet points awarded to the airline for each of the seven metrics. That’s the part that is far from transparent and is, AvGen believes, flawed. Heathrow consistently declines to provide a breakdown of how many of the points that make up an airline’s published total Fly Quiet score have been gained from each of the seven metrics. That refusal is ridiculous and disingenuous, particularly given that Heathrow identifies which airline is best, second-best, third-best, etc, for each of the metrics and states how those rankings are supposed to translate unambiguously into Fly Quiet points. Our view is that Heathrow cannot publish the Fly Quiet points breakdown per metric because it would reveal that points are not being awarded in accordance with the stated rules of the scheme. Specifically, we believe that airlines performing poorly on any of the seven metrics are being overmarked, sometimes significantly, which inflates the resulting Fly Quiet points scores. Heathrow could, if it chose, address our criticisms by simply publishing the points breakdown for the world to see. In July 2017, Heathrow published the first of a new series of quarterly Fly Quiet & Green statistics, ranking airlines on several different aspects of their environmental performance. Shortly after publication, AvGen drew Heathrow’s attention to apparent anomalies in the calculation of the results. The published “league table” did not appear to be reproducible, despite using exactly the methodology and inputs published by Heathrow. AvGen requested some worked examples of the methodology from Heathrow in an attempt to identify where the discrepancies lay. Heathrow did not respond to this request. A subsequent request by AvGen elicited the response from Heathrow that it was satisfied with the accuracy of its results, but still without providing any examples to substantiate them. AvGen then provided Heathrow with a paper highlighting (with specific examples) areas where it believed Heathrow’s analysis was flawed. No response was received to this. We will never know how China Southern, El Al, Korean Air, Kuwait Airways or Pakistan International Airlines are judged to have performed, because Egyptair short/longhaul, Icelandair (ditto) and MEA longhaul (all with fewer flights than any of the above) have been substituted instead. In fact El Al and China Southern had over three times as many flights as MEA longhaul during Q4. We will, as usual, invite Heathrow’s comments on our findings, though past experience suggests there will be none. Heathrow could, of course, choose to publish a breakdown of how many points each metric contributed to airlines’ aggregate scores – but that would make its flawed results even more obvious. Incidentally, although Heathrow never acknowledges it when I send Matt Gorman, Richard Norman and Nigel Milton a copy our our quarterly findings, they have taken note of one of the issues I raised in the email. Those have now been fixed on the website..
a) Individual airline scores are inflated by between 17% and 240%, with the poorest performing carriers receiving the biggest unjustified increase in their score. The 544 points score awarded by Heathrow to MEA shorthaul is over 380 points more than the airline actually merits based on its performance and Heathrow’s rules..
b) 48 out of the 50 airlines in Heathrow’s table are awarded more than the correctly calculated average (based on Heathrow’s data and methodology) of 522.
c) Turkish Airlines longhaul and Jet Airways are given an unexplained hike up the table, each by 15 places, compared to the positions that their performance merits. d) Among the airlines entitled to feel aggrieved with this quarter’s published results include Icelandair shorthaul, relegated 20 places from its rightful position.Turkish Airlines shorthaul, despite meriting 503 points by Heathrow’s own methodology, putting it just above Air Malta, bizarrely ends up ranked 21 places below the Maltese carrier. e) “RAG” (red/amber/green) classifications are again applied inconsistently; for example Thai Airways and TAP, ranked 44th and 45th, respectively, by Heathrow for early/late movements, get an “Amber” for that category while Scandinavian, ranked 34th for that metric by Heathrow, gets a “Red”. f) For the second successive quarter, 180 flights by Finnair’s A330 and A350 fleets (out of an airline total of 905) appear not to have been taken into account in calculating the results, with only its narrow-body A320 family flights having been counted. Consider just one airline: Oman Air. metrics in Q3 2018 merited an aggregate score of 917 – that’s only 83 points short of the 1,000 “perfect” score ! So how did Heathrow decide to deduct only 83 points ? The airport refuses to explain, probably because it makes no sense. Leaving aside the 2 metrics where Oman Air ranked Number One and so didn’t lose any points for those (Track-keeping and Early/Late Movements), we are left with the other 5 metrics (Noise Quota Count, Noise Chapter, NOx emissions, CAEP and CDAs) where those 83 points must therefore have been deducted (for 24th, 8th, 34th, 7th, and 20th place, respectively). We can easily deduce how much those 5 metrics each contributed to the 83 points lost, because Heathrow tells us how many places Oman dropped for each metric and the relative weighting per metric (50%, 50%, 50%, 50% and 150%, respectively). For Noise Quota, Oman dropped 23 places (47% of the way down), but only lost 15.2 points (17%) from the 89.3 available. For Noise Chapter, Oman dropped 7 places (14% of the way down), but only lost 4.6 points (5%) from the 89.3 available. For NOx, Oman dropped 33 places (67% of the way down), but only lost 21.7 points (24%) from the 89.3 available. For CDAs, Oman dropped 19 places (39% of the way down), but only lost 37.5 points (14%) from the 267.9 available. BUT the Fly Quiet rules state that, for each metric, the proportion of points deducted from the maximum available score is determined solely by how far down the table the airline is for that metric. So the above scores make no sense at all. If points deducted by Heathrow are compared with places dropped, then its flawed implementation of its own rules means that Oman, if it came bottom for every metric, would still be awarded 638 points instead of the 0 that the rules specify ! Posted: Tuesday, March 26th, 2019. Filed in Blog, News about Airports, Noise News, Recent News. A totally damning, ‘smoking gun’ memo has been located, showing how DfT staff in November 2017 were keen to avoid information showing how bad Heathrow noise would be – and how many people would be affected – with a 3rd runway. The Times reveals how DfT staff plotted to cover up warnings about the extra aircraft noise, with a 6-page document sent to Chris Grayling (Transport Secretary) recommending blocking a plan to tell millions of households (up to 13 million people) about the extra noise they could face from a 3rd runway. Grayling and the DfT claim publicly that a 3rd runway could be introduced with fewer people affected by plane noise even with 265,000 more annual flights – which, of course, beggars belief of anyone with half a brain. The DfT memo wanted to avoid alerting people to the noise problem, for fear that would cause “disruption” and “public debate” and “further scrutiny” and “unnecessary controversy” before the parliamentary vote on the NPS (in June 2018). The memo included a map that reveals DfT officials knew well how badly vast swathes of London and southern England (and Grayling’s own constituency) would be badly affected. Disgraceful DfT behaviour. Officials at the Department for Transport plotted to cover up warnings about the extra aircraft noise created by a third runway at Heathrow, a memo reveals. The six-page document — sent to Chris Grayling, the transport secretary — recommended blocking a plan to tell millions of households about the extra noise they could face from the airport’s £14bn expansion. It puts more pressure on the embattled minister, nicknamed “Failing Grayling” after a series of bungles. Chris Grayling and his department claim publicly that a third runway could be introduced with fewer people affected. The memo, sent in November 2017, lays bare officials’ concerns about alerting residents living beneath potential flight paths about the disruption they might face on the grounds that the publicity could lead to “further scrutiny” of the scheme and “unnecessary controversy” before a parliamentary vote. The memo included a map showing the area of London and southern England that could be flown over by planes at 7,000ft and lower. The map reveals that officials knew vast swathes of London and southern England could be affected. But Grayling and his officials insist publicly that a third runway, with an extra 265,000 flights a year across London and southern England, can be introduced with fewer residents affected by noise. One council leader accused Grayling of a “giant con” by failing to publish relevant noise maps for the scheme before the parliamentary vote in June that backed the expansion. The memo sent to Grayling warned that Heathrow planned to leaflet 5m people who could be affected by aircraft noise. 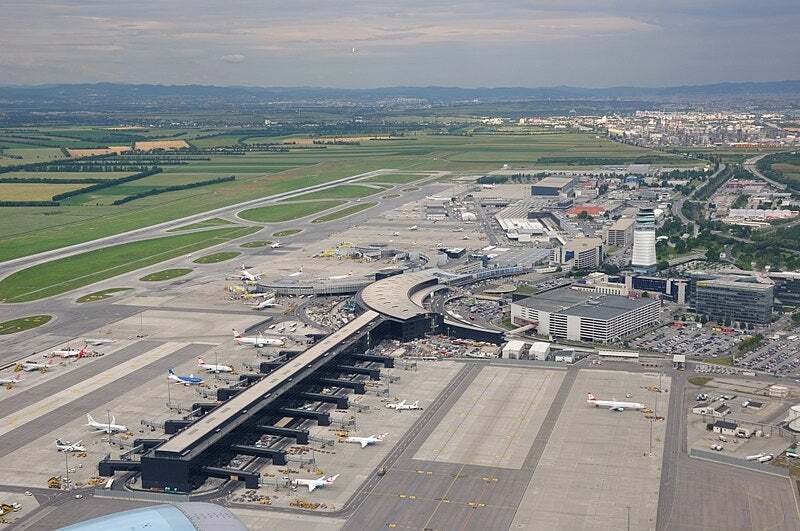 The airport was also planning a publicity campaign that would reach about 13m people. Officials warned that the plan was not “proportionate or sensible” and said a direct consultation was “not necessary”. The memo said it would underline the fact that no detailed flight paths had been published and could undermine support for a third runway. The memo was sent seven months before parliament voted to approve the runway. The minister was warned by his aviation team: “Using media to reach around 13m people who could be overflown by aircraft as a result of expansion is likely to create significant public debate and unnecessary controversy. “Most of the people receiving this communication will not have previously engaged with the expansion of the airport. Heathrow launched its expansion consultation early last year, with its leaflet and advertising campaign, despite the ministerial advice. The memo was produced as evidence by local councils and other parties for a judicial review of the Heathrow expansion scheme. The review, which has been heard over the past two weeks at the High Court in London, covered a range of complaints, including an alleged failure by the transport department to alert people who might be affected by increased noise. John Sauven, executive director of Greenpeace, one of the parties in the judicial review, said: “It is not possible to put another airport the size of Gatwick on the site without massive consequences on air pollution, noise and impacts on local people. A three-runway Heathrow would accommodate up to 740,000 flights a year, more than half as many again as the current 475,000. It is proposed that the third runway, which will require a development consent order, is completed by 2025. Some areas that have not previously suffered aviation noise are being warned that they may have up to 47 flights an hour passing overhead. Council experts say the areas at risk of increased noise include large parts of London and towns in the home counties, including Epsom in Surrey, Slough and Ascot in Berkshire; and High Wycombe in Buckinghamshire. The airport said the internal memo by Grayling’s officials had no impact on its final consultation between January and March 2018. Posted: Sunday, March 24th, 2019. Filed in General News, News about Airports, Noise News, Recent News. Heathrow wants to expand its operations to fly over areas with little aviation activity at present, including over north west London. The local paper for Hampstead and Highgate says that Hampstead is 500 ft above sea level and, in Heathrow’s first phase of expansion, (it wants an extra 25,000 flights per year in a couple of years from now – if permitted) it may be exposed to flights at 2,500 to 3,500 ft. The noise levels would be over 60 to 65 decibels (dB) – more than the level of background noise in a busy office – from 6am every morning. Highgate may be in the same position. That might work out as a flight overhead every 2.5 minutes between 6am and 7am and one every 10 mins thereafter from 7am to 11.30pm. If there is then a 3rd runway, there could be a flight every minute, with the noise of most being above 65dB. The negative effects on health, (from noise and air pollution) and noise impacts on the education of children are well known. The paper says: “That Heathrow is pushing ahead with expansion despite these impacts beggars belief.” While more studies need to be done on the health risks of aviation noise, it is a serious concern for residents accustomed to zero noise who are then subjected to noise above 65dB at least 40 times a day. Chris Grayling left thousands of people in the dark over increased noise pollution from an expanded Heathrow by under-stating the impact of new flight paths. At the High Court hearings, lawyers for five London councils, the London Mayor Sadiq Khan and Greenpeace claim this amounts to a breach of the law under which the Transport Secretary should have identified all areas that might be affected. The Councils say that instead of an environmental report showing which communities were going to be hit by noise from flights, Mr Grayling only published “indicative flight paths.” They say “The flight paths were drawn in such a way that the numbers of people affected were minimised. This meant the health and environmental costs of the north west runway were under-stated.” Maps compiled by the councils suggest as many as 1 million more households will be affected by planes at 7,000 ft, or below, with decibel levels of at least 65, (equivalent to a vacuum cleaner in a room). A vast circular area stretching from Didcot in the west, Dartford and Romford in the east, Tring, Harpenden and Welwyn Garden City to the north, and Godalming, Leatherhead, Epsom and Copthorne – and many more places – to the south would be affected. The NPS failed to deal properly with the impact on air quality, climate change, noise and congestion. Epsom & Ewell Borough is an area that is currently overflown by Heathrow planes at about 6,000 and 7,000 feet. Its Council has submitted a robust response to Heathrow’s airspace change consultation, furious about the vastly worse noise burden with which the borough is threatened. The proposals would perhaps mean additional flights operating as low as 3,000 feet at a frequency of up to 47 flights per hour for arrivals, and 17 flights per hour for departures. Even the extra flights, in the short term, through IPA, could result in 25 flights per hour operating as low as 3,000 feet between 6am to 7am and 6 flights per hour at other times. Cllr Eber Kington, Chairman of the Council’s Strategy & Resources Committee, said the changes could mean a four to five-fold increase in noise levels in addition to the significant additional impact from the frequency of flights overhead and the impact on air quality. Cllr O’Donovan complained at how bad the consultation was. Residents are angry that their own MP, Chris Grayling, is pushing for these hugely damaging noise impacts on his own constituents and voters – with inevitable decrease in local quality of life. The Government’s approval of a third runway is being challenged at the High Court by a coalition of councils, residents, environmental charities and Mayor of London Sadiq Khan. Representing five London boroughs, Greenpeace and Mr Khan, Nigel Pleming QC said the plans could see the number of passengers using Heathrow rise to around 132 million, a 60% increase. Mr Pleming said: “The new development, if it goes ahead, will add, in effect, a new airport with the capacity of Gatwick to the north of Heathrow” and that the adverse effects and consequences for local residents of such an expansion are “bound to be severe”. The legal challenges (other than the one by Heathrow Hub) say the Government’s National Policy Statement (NPS) setting out its support for the project fails to properly deal with the impact on air quality, climate change, noise and congestion. The claimants argue the NPS is unlawful and should be quashed, which would mean the Government would have to start the process again and put it to another vote in Parliament. Scores of demonstrators gathered outside the court ahead of the hearing, addressed by MPs, Council leaders and campaigners. All are determined that this runways is NOT going to go ahead. The hearings will last for 2 weeks. Posted: Saturday, March 23rd, 2019. Filed in Blog, News about Airports, Noise News, Recent News. Chris Grayling left thousands of people in the dark over increased noise pollution from an expanded Heathrow by under-stating the impact of new flight paths. 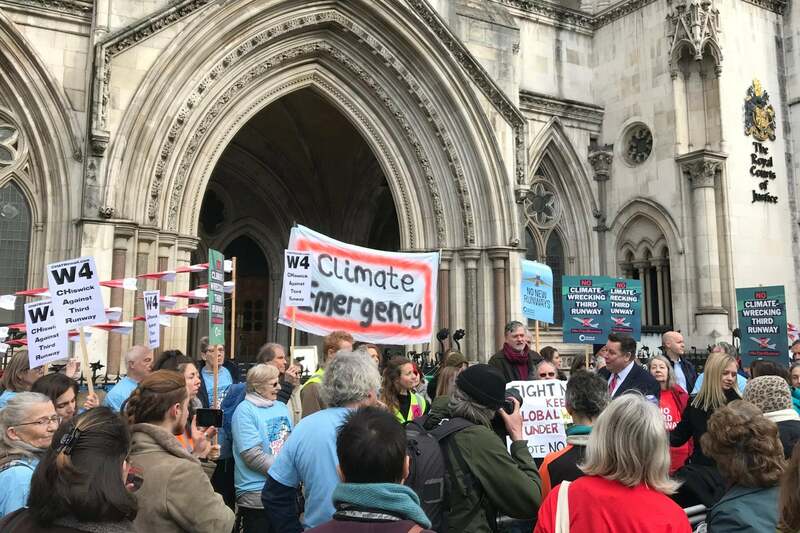 At the High Court hearings, lawyers for five London councils, the London Mayor Sadiq Khan and Greenpeace claim this amounts to a breach of the law under which the Transport Secretary should have identified all areas that might be affected. The Councils say that instead of an environmental report showing which communities were going to be hit by noise from flights, Mr Grayling only published “indicative flight paths.” They say “The flight paths were drawn in such a way that the numbers of people affected were minimised. This meant the health and environmental costs of the north west runway were understated.” Maps compiled by the councils suggest as many as 1 million more households will be affected by planes at 7,000 ft, or below, with decibel levels of at least 65, (equivalent to a vacuum cleaner in a room). A vast circular area stretching from Didcot in the west, Dartford and Romford in the east, Tring, Harpenden and Welwyn Garden City to the north, and Godalming, Leatherhead, Epsom and Copthorne – and many more places – to the south would be affected. The NPS failed to deal properly with the impact on air quality, climate change, noise and congestion. Chris Grayling left thousands of people in the dark over increased noise pollution from an expanded Heathrow by understating the impact of new flight paths, the High Court will be told today. Lawyers for five London councils, the London Mayor Sadiq Khan and Greenpeace claim this amounts to a breach of the law under which the Transport Secretary should have identified all areas that might be affected. Instead of an environmental report showing which communities were going to be hit by noise from flights, Mr Grayling only published “indicative flight paths,” say the councils. “The flight paths were drawn in such a way that the numbers of people affected were minimised. This meant the health and environmental costs of the north west runway were understated,” said Cllr Gareth Roberts, leader of Richmond Council, one of the five councils. Maps, seen by The Daily Telegraph, suggest as many as 1m more households will be affected by planes at 7,000 ft with decibel levels of at least 65, equivalent to a vacuum cleaner in a room or a door on a noisy office being opened onto a quiet suburban garden. The maps, compiled by the councils from Heathrow’s data, show a circular area affected stretching from Didcot in the west, Dartford and Romford in the east, Tring, Harpenden and Welwyn Garden City to the north, and Godalming and Copthorne to the south. “The Secretary of State kept communities across south and west London in the dark about whether they would be affected by noise. If they couldn’t know they might be affected, they couldn’t be expected to respond to the consultation,” said Cllr Ravi Govindia, Wandsworth council leader. The councils and Greenpeace claim the Government’s National Policy Statement (NPS) on Heathrow expansion fails to deal properly with the impact on air quality, climate change, noise and congestion. They argue the NPS is unlawful and should be quashed, which would mean the Government would have to start the process again and put it to another vote in Parliament. The court was told yesterday the extra 260,000 flights a year from building a new runway effectively created a “new airport” the size of Gatwick, with “severe” consequences for Londoners. Nigel Pleming, QC, for the councils, said the plans could see the annual number of passengers rise to 132 million, up 60 per cent. The councils also claim the Government has underestimated the impact of the increased traffic on pollution. They say daily passenger airport trips will increase by almost 100,000 to 370,000 a day, with freight journeys almost doubling to 36,500. The councils say the Government’s own calculations suggest it would mean the UK continuing be at risk of breaching EU pollution limits in 2030. “Even without further expansion, pollution levels in the area which already exceed statutory levels and will not be below legal limits for many years to come,” said Hillingdon council leader Ray Puddifoot. The councils are one of five groups mounting judicial reviews, being heard over the next two weeks. They include Friends of the Earth, Plan B, Heathrow Hub and Neil Spurrier. Posted: Tuesday, March 12th, 2019. Filed in News about Airports, Noise News, Recent News. Controversial plans to expand Heathrow would have “severe” consequences for Londoners, the High Court has heard. Representing five London boroughs, Greenpeace and Mr Khan, Nigel Pleming QC said the plans could see the number of passengers using Heathrow rise to around 132 million, a 60 per cent increase. Scores of demonstrators gathered outside the court ahead of the hearing, which was told the expansion would effectively create a “new airport”. He added that the adverse effects and consequences for local residents of such an expansion are “bound to be severe”. The case is being brought against Transport Secretary Chris Grayling by local authorities and residents in London affected by the expansion and environmental charities. They claim the Government’s National Policy Statement (NPS) setting out its support for the project fails to properly deal with the impact on air quality, climate change, noise and congestion. Charities Friends Of The Earth and Plan B argue Mr Grayling failed to take enough account of the impact on air quality when reaching the decision to approve the third runway. Construction could begin in 2021, with the third runway operational by 2026, the hearing, which is before Lord Justice Hickinbottom and Mr Justice Holgate, heard. Building a third runway at Heathrow airport would have “severe” negative consequences for local residents, the High Court heard at the opening of a legal challenge to the government’s backing of the scheme. Heathrow’s expansion was recommended by the Airports Commission and approved by MPs in June 2018 with a majority of 296. After the vote, the government adopted a national policy statement, which contained principles for the expansion. The judicial review, which is expected to last two weeks, is looking at the process of the statement’s adoption. Five challenges to the decision on the future of the UK’s biggest aviation hub are being heard together, including one brought by a consortium of local authorities, campaigning organisation Greenpeace and London Mayor Sadiq Khan, on the grounds of air quality, climate change, noise pollution and transport access. Mr Pleming, who acted for one of the councils in the 2010 challenge that derailed Heathrow’s last expansion attempt, laid out the grounds for the current review, which included a claim that the transport secretary had ignored the “high risk” that expansion would breach air quality standards. He also said targets for changing how people travelled to Heathrow, moving from private cars to public transport, were “neither adequate nor achievable”, citing likely overcrowding on the London Underground’s Piccadilly line, which serves the airport as one example. Lord Justice Hickinbottom, one of two judges presiding, said that while the complainants and members of the public had “sincere and deep concerns about issues such as air quality”, the review was concerned with the legality of the Airports National Policy Statement, rather than the merits or otherwise of expanding Heathrow. Simon Dudley, leader of Windsor & Maidenhead council, one of the claimants in the review, said that since the Airports Commission had recommended a third runway at Heathrow, the process had developed a political inevitability: “We can’t stop going along that conveyor belt until we stop Heathrow in court,” Mr Dudley said. He recommended building a hub airport elsewhere in the UK. At a rally outside the High Court before the case opened, Susan Kramer, former MP for Richmond Park in south-west London, a constituency near Heathrow, said the cost of the third runway would finally fall on the public and compared it to budget overruns with Crossrail and the HS2 railway. “This whole strategy of underestimating the costs to get a project over the line and leaving it to the taxpayer to pick up the burden has run its course,” she said. Posted: Tuesday, March 12th, 2019. Filed in Air Quality, Climate Change News, General News, News about Airports, Noise News, Recent News. Epsom & Ewell Borough Council has submitted a robust response to Heathrow Airport Limited’s consultation on changes to existing airspace and future runway operations. The consultation sets out how increased flights using the existing two runways and the proposed expansion to a third runway could operate in practice. This includes fundamental changes to the flightpaths and the geographic areas that are most likely to be impacted. The borough of Epsom and Ewell is featured within four ‘design envelopes’ set out in Heathrow Airport Limited’s consultation on airspace and future operations. These proposals could result in the borough being overflown by aircraft far more frequently and at significantly lower altitudes. Currently a proportion of aircraft arriving at or taking off from Heathrow airport fly over the borough at a height ranging from 7,000 to 22,000 feet [6,000 to 8,000 mainly. AW note] with the average being closer to about 12,000 feet. However, the proposals for an expanded Heathrow airport specifies additional flights operating as low as 3,000 feet at a frequency of up to 47 flights per hour for arrivals, and 17 flights per hour for departures. Even without an additional runway, Heathrow Airport Limited’s proposed adoption of the Independent Parallel Approach (IPA) using the existing two runways would result in 25 flights per hour operating as low as 3,000 feet between 6am to 7am and 6 flights per hour at other times. In addition to the above, the borough borders an area directly to the North where it is proposed that aircraft would be flying at even lower altitudes i.e. down to just 2,000 feet. Councillor Eber Kington, Chairman of the Council’s Strategy & Resources Committee, said: “For people living, working and studying in Epsom and Ewell these proposals could translate into an estimated four to five-fold increase in noise levels in addition to the significant additional impact from the frequency of flights overhead and the impact on air quality caused by increased air pollution levels including increased carbon dioxide (CO2), nitrogen oxides (NOx) and other compounds harmful to human health and the environment. Embattled Transport Secretary and Epsom and Ewell MP Chris Grayling came under fire from constituents over his support for Heathrow Airport’s expansion today (March 5). Mr Grayling, who is facing calls to resign over his handling of Brexit contingency plans, was criticised by residents of his Epsom and Ewell constituency following a public consultation about the expansion proposals. Responding to the Airspace and Future Operations consultation, Councillor Eber Kington, Chair of the Council’s Strategy and Resources Committee refuted Mr Grayling’s 2016 claim that “fewer people will be affected by noise than is the case today” regarding the planned expansion. One proposal for the expansion suggested new airspace arrangements which would see up to 47 planes per hour flying over the Epsom and Ewell constituency at just 3,000 feet. Currently no planes fly over the area below about 6,000 feet altitude according to the Airspace and Future Operations Consultation document. Speaking to the No 3rd Runway Coalition campaign, which is challenging the expansion plans, Epsom resident Sarah Clayton joined the growing chorus of voices demanding Grayling’s resignation. Coordinator of the Coalition Rob Barnstone meanwhile cited specific health disturbances which could result from the expansion as a central reason why so many residents in Epsom and Ewell were opposed to Mr Grayling’s support for more flight paths at Heathrow. Mr Barnstone said: “We know that disturbance from aircraft noise, particularly at lower levels of altitude, has a series of health impacts, including but not limited to hypertension, onset of heart disease, decreased mental wellbeing and performance of children at school. Mr Grayling’s Westminster and Constituency offices were contacted for comment. The response from residents followed a Richmond and Twickenham Times report which showed that the proposals could see new flight paths directly over Royal Park in Richmond. The park, which stretches over 1,000 hectares (2,500 acres), is a site of special scientific interest, a national nature reserve and a European conservation area. Mr Grayling refused calls from the Labour opposition to resign his role as transport secretary on March 5 after it was revealed that UK taxpayers in effect paid the Eurotunnel company £33 million in a settlement after the company brought legal action against the “secretive” process purportedly pursued by Mr Grayling to strike shipping deals aimed at guaranteeing key supplies if the UK leaves the EU without a deal on 29 March. “I will carry on serving the Prime Minister as long as she wants me to,” Mr Grayling told Sky News. Posted: Wednesday, March 6th, 2019. Filed in General News, News about Airports, Noise News, Recent News. The embattled transport secretary, Chris Grayling, was fighting for his political life this weekend as Tory council bosses accused him of a “giant con” over Heathrow’s third runway. Jet noise maps, published by the airport and analysed by local authorities, reveal the potential noise impact, once the runway is complete, across huge swathes of London and southern England that were not previously overflown. In some areas of the capital and the home counties that have not previously suffered jet noise, the noise maps reveal that up to 47 flights an hour might pass overhead. In October 2016 Grayling promised parliament that “fewer people will be affected by noise than is the case today” after the third runway was built. He made the pledge even though the expansion would mean more than 250,000 extra flights a year, equivalent to bolting an additional airport almost the size of Gatwick onto the existing site. A three-runway Heathrow will accommodate up to 740,000 flights a year, more than half as many again as the current 475,000. Grayling believes aircraft will be quieter and so affect fewer residents. This weekend council bosses, including the leaders of Wandsworth and Windsor and Maidenhead, said the documents demolished Grayling’s claim. Court proceedings on the case will start next week. Ravi Govindia, the Tory leader of Wandsworth council, said the public had been the victims of a “giant con”. He said: “It beggars belief that people will believe Chris Grayling in his assertion that no more people will be affected. When you see the maps, virtually the whole of London and a large part of the southeast will be affected by additional flights. The new row comes after Grayling has been accused of incompetence and mismanagement over the awarding of a ferry contract to a firm with no ships. The government agreed to pay £33m in compensation to Eurotunnel last week over the “secretive”contract process. The new maps, released as part of a Heathrow consultation on airspace and future operations that began in January, identify “design envelopes” where planes may pass overhead at sound levels of 65 decibels and higher after the completion of the third runway by 2025. Council experts who have analysed the documents say the areas at risk of additional noise include large areas of London, such as parts of Westminster, Kensington, Chiswick, Balham, Fulham, Tooting and Hammersmith. Towns and commuter-belt communities in the home counties, including Chertsey and Epsom in Surrey; Maidenhead, Slough and Ascot in Berkshire; and High Wycombe in Buckinghamshire, are also caught up. Five councils — Windsor and Maidenhead, Richmond, Wandsworth, Hillingdon and Hammersmith and Fulham — are seeking a judicial review of the Heathrow expansion in a hearing due to start next week. Simon Dudley, Tory leader of Windsor and Maidenhead council, said he believed the noise maps now available had been previously withheld by Grayling’s officials “with the intention or deceiving and misleading public”. The battle over Heathrow has been one of the most controversial planning battles in recent decades. In May 2010 the Conservative-Liberal Democrat coalition scrapped plans for a third runway, but two years later the proposal was back on the table as an independent commission was set up to examine airport expansion. The Heathrow proposal was backed by ministers in 2016, and MPs voted in favour of the plans in June last year. The Department for Transport said: “We absolutely refute these claims and are confident that fewer people will be affected by noise pollution under the new flight paths planned. The airports national policy statement agreed by the government makes it clear that we expect noise mitigation measures to limit, and where possible reduce, the impact of aircraft noise.” [This is the department for which Grayling has responsibility. It is still putting out this nonsense. The claim can only be justified by using extraordinarily distorted definitions of noise, far from the reality any ordinaryperson would understand. Distorting noise metrics for the DfT’s and Heathrow dishonest convenience. AW comment]. A Heathrow spokesman said, “Parliament voted overwhelmingly to back Heathrow expansion last year, and we continue to engage with local people as we develop our plans.” [They voted for it partly because most MPs do not have constituencies affected by Heathrow; – they did not really care; the Tories were whipped into voting in favour; some powerful unions lobbied very hard to get Labour MPs to vote for it, with unrealistic hopes of future jobs; and Grayling misled Parliament on many issues – this noise one as a case in point. He also ignored the climate implications, and the Paris Agreement. As well as most air pollution, more than 2km from the airport. All shocking abuse of the role of Parliament. AW comment]. Posted: Monday, March 4th, 2019. Filed in General News, News about Airports, Noise News, Recent News. Over 300 people attended a meeting organised by the Teddington Action Group (TAG) to discuss Heathrow’s Airspace Consultation, and urge residents to respond by 4th March. Among the speakers, Paul McGuinness (Chair of the No 3rd Runway Coalition) reminded the audience that these were the first details of how Heathrow plan to break the promises made to communities at the time its 5th Terminal was built – that the airport would accept a cap of 480,000 per year and never apply to build a 3rd runway: “… by any reasonable standards, what Heathrow is demanding communities to endure so it can increase flights by over 50%, is wholly disproportionate”. Speakers explained how massive the noise impact would be on Richmond and Twickenham. Stephen Clark said: “Easterly departures will carry more planes along concentrated flight paths, at lower altitude, while arrivals traffic would now fly above them simultaneously”. Physicist Dr David Gilbert, explained how the DfT assessment of noise had significantly underestimated its impact, and how Richmond residents living under the proposed Independent Parallel Approaches (IPA) will be subjected to continuous, unbroken days of noise. Over 300 people attended a meeting organized by the Teddington Action Group (TAG) to discuss Heathrow’s Airspace Consultation, and urge residents to respond by 4thMarch. Among the speakers, Paul McGuinness (Chair of the No 3rd Runway Coalition) reminded the audience that these were the first details of how Heathrow plan to break the promises made to communities at the time its 5th Terminal was built – that the airport would accept a cap of 480,000 per year and never apply to build a third runway. He stated: “In terms of poor air quality and noise, and by any reasonable standards, what Heathrow is demanding communities to endure so it can increase flights by over 50%, is wholly disproportionate”. Twickenham MP, Sir Vince Cable, remarked that: “Heathrow would appear to have not lost their flair for public relations. I have just received a letter relating to this matter from Heathrow, addressed to my late wife who died 18 years ago”. Dr. David Gilbert and Stephen Clark, of TAG, revealed analysis demonstrating just how great the adverse noise impacts of Heathrow’s “Flight Path Envelopes” would be on the residents of Richmond and Twickenham. “Easterly departures will carry more planes along concentrated flight paths, at lower altitude, while arrivals traffic would now fly above them simultaneously”, said Stephen Clark. Physicist Dr David Gilbert, explained how the Department for Transport’s assessment of noise had significantly underestimated its impact, and how Richmond residents living under the proposed Independent Parallel Approaches (under which two lines of arrivals will fly side by side) will be subjected to continuous, unbroken days of noise. Greeted as a hero, Neil Spurrier, a resident of Strawberry Hill, spoke about his experiences as one of the claimants against the government’s Aviation National Policy Statement, which gave the green light for Heathrow to apply for expansion. Other claimants in this Judicial Review proceeding, which commences at the High Court in March, include the London Borough of Richmond-upon-Thames. and there are the usual upbeat little videos which fail to point out the very real horrors we face under their proposals. The question numbers go 6,7,8,1,2,3 and 4 – apparently to coincide with the links. There are lots of detailed documents there to read which explain all this in greater depth. Question 6: Factors to be aware of when designing flightpaths for third runway. Suggested answer: I don’t want low and concentrated flightpaths over my home. No planes should go over at 1000 or 1500ft this far from the runway and never with arrivals layered on top. These proposals are about cramming too many planes into too congested an airspace and then pitting communities against each other. You are not limiting or reducing noise by your proposals and will harm our health and quality of life irreparably. Communities around Heathrow up to 30 miles from the airport are being sacrificed to line the pockets of Heathrow’s foreign shareholders. Question 7: Factors to be aware of when designing new arrival paths to make better use of existing 2 runways. Suggested answer: We are already severely impacted in Teddington when on Easterlies and won’t get runway alternation for several years. We do not want any extra planes going over this densely populated area. Our health is already being damaged by aviation noise and pollution and any expansion is incompatible with climate change. Suggested answer: A third runway is estimated to add an additional 54,000 cars a day on local roads, and this will increase the toxic air for residents. Scientific evidence has shown that particulate matter is found under flightpaths 10km from airports and this can raise the risk of miscarriage and dementia. Also, a study in 2017 found a particularly high number of airborne nanoparticles of heavy metals, harmful to human health, in the grounds of Montreal Airport. Putting more planes in the sky over such a densely populated area will cause its own dangers. Question 1a: Do you support our proposals for a noise objective? Suggested answer: The local noise policy does not conform with nationally adopted health and environmental protections. National aviation policy makes noise minimisation the top priority at low altitudes – this can’t be qualified by aviation’s commercial considerations. If Heathrow wanted to limit and reduce the effects of noise on health and quality of life it wouldn’t be expanding Heathrow or trying to add 25,000 more planes now. No-one believes that an expanded Heathrow will be quieter than 2013 no matter how much the noise footprint is manipulated. No-one, especially children, should be kept awake late into the night or woken around 5am by planes. The World Health Organisation (WHO) recommends 8 hours of undisturbed sleep and current operations prevent this for many of us already. Suggested answer: The way noise measurement is averaged out is meaningless – single noise events are what wake people up. The WHO strongly recommends reducing average noise levels to below 45decibels as aircraft noise above this level is associated with raised blood pressure, cardio-vascular disease, stress etc. Protecting communities from aviation noise should always take priority over commercial interests. Both options are unacceptable. The best they seem to be offering are breaks from “overflight” but how low or how far away a plane has to be to be considered overflight took the CAA 38 pages to clarify and there remain many areas of uncertainty. There is no research on what constitutes an acceptable period of respite, whether this can be achieved at Heathrow or penalising the airport for failure to adhere to respite. Neither of the respite periods suggested are long enough to prevent harm to health and there are no formal governance structures planned to enforce respite arrangements. Question 3a. Should we continue to prefer westerly operations during the day and easterly operations at night to reduce the total number of people affected by noise? Suggested answer: Planes are louder on take-off because they have to climb and carry heavy fuel loads. Westerly preference was created to protect the greatest number of people from the severest impacts of louder departures. This should not be changed. If any variations were to be considered it would have to be accompanied by very clear legally binding rules including comprehensive compensation for those communities that will be impacted, as historically people would have moved to areas to avoid Heathrow’s impacts. Question 3c: Should we sometimes intervene to change the direction of arriving and departing aircraft to provide relief from prolonged periods of operating in one direction – even if that means slightly increasing the number of people affected by noise? No – unless Heathrow were to adopt a completely different approach to noise management including flying much higher and quieter, and accept legally binding obligations to minimise its significant adverse health impacts. It would need to commit to noise sharing between communities on a fully fair and equitable basis and crucially to making all areas in its catchment fit for human habitation having regard to independent health advice (such as WHO). Please note the exact times are subject to further evaluation of the options. Neither of the options are acceptable. Areas under departures such as ours experience no scheduled departures before 6am and as a minimum this threshold must be maintained for all departures (the question relates to arrivals). However, for arrivals, it is apparent Heathrow is even seeking to erode the proposed 6.5-hour night flight ‘ban’ by excluding taxiing time before planes take off or disembarkation, due to its own ‘scheduling’ considerations. Question 4b: Please tell us reasons for preference. Suggested answer: Internationally accepted medical advice is that 8 hours sleep a night is necessary for good health. Scheduled flights should not start before 7am so that the community, and particularly children, can attempt to get closer to the recommended 8 hours of sleep for good health. No suggested answer. A night flight ban should mean no flights whatsoever and not be eroded for ‘scheduling’ or other operational reasons. Late evening departures should stop at 11pm and stringent sanctions must be imposed for overrunning (contingencies should be built into the timetable to avoid late departures). Suggested answer: There should be effective restrictions on the noisiest aircraft, with much higher charges at night. These should relate directly to the health damage done to communities under the universally accepted ‘polluter pays’ principle. Any operational bans or methods of “encouragement” require a formal governance structure, limitations on Heathrow operations to prevent environmental blight on communities miles around the airport must be formalised and no longer a voluntary option for Heathrow. Question 5b: Any other comments on night flights and restrictions. Suggested answer: Late-running planes have been a far too common occurrence, and this is often caused by far too many planes being scheduled from 10.15pm onwards. This is an abuse of the system and results from the ‘voluntary nature’ of Heathrow’s operational restrictions. Over scheduling has blighted the lives of communities on both sides of the airport for years and must be stopped. Posted: Tuesday, February 19th, 2019. Filed in News about Airports, Noise News, Recent News.